Photography was my supporting study on my B.A. (Hons) in Textile Design at Farnham and I have loved it ever since then. It was also an important part of my recent M.A. However, frustration reigns in the taking of professional photographs of my work. I have tried several 'props' - next step - a model I guess! Everything is so important. Lighting, background, settings of the camera, skill, knowledge, practice. I have had a couple of professional photo-shoots done and to be honest, they were awful. Recently I attended a photography hour long lesson. I was impressed. My old Panasonic bridge camera has facilities I didn't know about. How do fellow designers take these professional looking photos with a pure white background? Richard of J & S Cameras, Barnstaple enlightened me. White balance! Working in aperture priority, click through the settings, click on white balance and set. Place a piece of white paper in front of the camera - take a pic and hey presto. Your camera sets a pure white background and colour accuracy. No more yellow. In Photoshop, levels, there are three little ticks at the bottom right. I hadn't even noticed them! The right hand one is white balance. (The left hand one is used to click on your black). Take your yellow pics, click on the supposed-to-be white background with the right tick and wow. White background and much more accurate colour and professional looking pics. It takes a bit of practice. I still have a lot to learn and am still not satisfied with my efforts but I am getting there, hopefully. 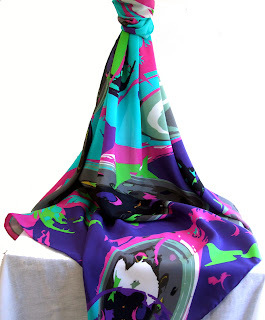 scarf, a powerful design with strong colours from my series, 'The 'Zen' of Road Tankers'. Not a good pic. Really dark and disappointing. The colour is inacurate. and background a dirty yellow. One for the bin! I just couldn't improve it. 'Swirls' A pure silk crepe de chine scarf 90 cms sqare. After my instruction on 'white balance', I am impressed that the colour is correct and although I have not removed all of the background, it is still much better. I have decided that I rather like a bit of 'base' for the scarf to sit on, otherwise, it looks as if it is floating. This is just to give those who, like me, don't know about this wonderful facility, an idea of what it does. Magic! It just gives an ordinary photo a professional edge.